A generic drug is a pharmaceutical drug that has the same chemical substance as the drug that was originally developed, patented and innovated. Generic drugs are allowed for sale after the expiry of the patent of the original drugs. Because the active chemical substance is the same, the medical profile of generics is believed to be equivalent in performance. The generic drug has the same active pharmaceutical ingredient (API) as the original, but it may differ in characteristics such as manufacturing process, formulation, excipients, color, taste, and packaging. Biopharmaceuticals, such as monoclonal antibodies, differ biologically from small molecule drugs. Biosimilars have active pharmaceutical ingredients that are almost identical to the original product and are typically regulated under an extended set of rules, but they are not the same as generic drugs as the active ingredients are not the same as those of their reference products. In most cases, generic products become available after the patent protections, afforded to a drug's original developer, expire. Once generic drugs enter the market, competition often leads to substantially lower prices for both the original brandname product and its generic equivalents. In most countries, patents give 20 years of protection. However, many countries and regions, such as the European Union and the United States, may grant up to five years of additional protection ("patent term restoration") if manufacturers meet specific goals, such as conducting clinical trials for pediatric patients. Manufacturers, wholesalers, insurers, and drugstores can all increase prices at various stages of production and distribution. "Branded generics" on the other hand are defined by the FDA and NHS as "products that are (a) either novel dosage forms of off-patent products produced by a manufacturer that is not the originator of the molecule, or (b) a molecule copy of an off-patent product with a trade name." Since the company making branded generics can spend little on research and development, it is able to spend on marketing alone, thus earning higher profits and driving costs down. For example, the largest revenues of Ranbaxy, now owned by Sun Pharma, came from branded generics. Generic drug names are constructed using standardized affixes that distinguish drugs between and within classes and suggest their action. When a pharmaceutical company first markets a drug, it is usually under a patent that, until it expires, the company can use to exclude competitors by suing them for patent infringement. Pharmaceutical companies that develop new drugs generally only invest in drug candidates with strong patent protection as a strategy to recoup their costs to develop the drug (including the costs of the drug candidates that fail) and to make a profit. The average cost to a brand-name company of discovering, testing, and obtaining regulatory approval for a new drug, with a new chemical entity, was estimated to be as much as $800 million in 2003 and $2.6 billion in 2014. Drug companies that bring new products have several product line extension strategies they use to extend their exclusivity, some of which are seen as gaming the system and referred to by critics as "evergreening", but at some point there is no patent protection available. For as long as a drug patent lasts, a brand-name company enjoys a period of market exclusivity, or monopoly, in which the company is able to set the price of the drug at a level that maximizes profit. This profit often greatly exceeds the development and production costs of the drug, allowing the company to offset the cost of research and development of other drugs that are not profitable or do not pass clinical trials. Large pharmaceutical companies often spend millions of dollars protecting their patents from generic competition. Apart from litigation, they may reformulate a drug or license a subsidiary (or another company) to sell generics under the original patent. Generics sold under license from the patent holder are known as authorized generics. Generic drugs are usually sold for significantly lower prices than their branded equivalents and at lower profit margins. One reason for this is that competition increases among producers when a drug is no longer protected by patents. Generic companies incur fewer costs in creating generic drugs—only the cost of manufacturing, without the costs of drug discovery and drug development—and are therefore able to maintain profitability at a lower price. The prices are often low enough for users in less-prosperous countries to afford them. For example, Thailand has imported millions of doses of a generic version of the blood-thinning drug Plavix (used to help prevent heart attacks) from India, the leading manufacturer of generic drugs, at a cost of 3 US cents per dose. Generic drug companies may also receive the benefit of the previous marketing efforts of the brand-name company, including advertising, presentations by drug representatives, and distribution of free samples. Many drugs introduced by generic manufacturers have already been on the market for a decade or more and may already be well known to patients and providers, although often under their branded name. India is a leading country in the world's generic drugs market, exporting US$17.3 billion worth of drugs in the 2017–18 (April–March) year. India exports generic drugs to the United States and the European Union. In the United Kingdom, generic drug pricing is controlled by the government's reimbursement rate. The price paid by pharmacists and doctors is determined mainly by the number of license holders, the sales value of the original brand, and the ease of manufacture. A typical price decay graph will show a "scalloped" curve, which usually starts at the brand-name price on the day of generic launch and then falls as competition intensifies. After some years, the graph typically flattens out at approximately 20% of the original brand price. In about 20% of cases, the price "bounces": Some license holders withdraw from the market when the selling price dips below their cost of goods, and the price then rises for a while until the license holders re-enter the market with new stock. The NHS spent about £4.3 billion on generic medicines in 2016-17. In the mid 2010s the generics industry began transitioning to the end of an era of giant patent cliffs in the pharmaceutical industry; patented drugs with sales of around $28 billion were set to come off patent in 2018, but in 2019 only about $10 billion in revenue was set to open for competition, and less the next year. Companies in the industry have responded with consolidation or turning to try to generate new drugs. Most nations require generic drug manufacturers to prove that their formulations are bioequivalent to their brand-name counterparts. Bioequivalence does not mean generic drugs must be exactly the same as the brand-name product ("pharmaceutical equivalent"). Chemical differences may exist; a different salt or ester may be used, for instance. Different inactive ingredients means that the generic may look different to the originator brand. However, the therapeutic effect of the drug must be the same ("pharmaceutical alternative"). Most small molecule drugs are accepted as bioequivalent if their pharmacokinetic parameters of area under the curve (AUC) and maximum concentration (Cmax) are within a 90% confidence interval of 80–125%; most approved generics are well within this limit. For more complex products—such as inhalers, patch delivery systems, liposomal preparations, or biosimilar drugs—demonstrating pharmacodynamic or clinical equivalence is more challenging. Enacted in 1984, the Drug Price Competition and Patent Term Restoration Act, informally known as the Hatch–Waxman Act, standardized procedures for recognition of generic drugs. In 2007, the FDA launched the Generic Initiative for Value and Efficiency (GIVE): an effort to modernize and streamline the generic drug approval process, and to increase the number and variety of generic products available. Before a company can market a generic drug, it needs to file an Abbreviated New Drug Application (ANDA) with the Food and Drug Administration, seeking to demonstrate therapeutic equivalence to a previously approved "reference-listed drug" and proving that it can manufacture the drug safely and consistently. For an ANDA to be approved, the FDA requires the bioequivalence of a generic drug to be between 80% and 125% of the innovator product. (This range is part of a statistical calculation, and does not mean that generic drugs are allowed to differ from their brand-name counterparts by up to 25 percent.) The FDA evaluated 2,070 studies conducted between 1996 and 2007 that compared the absorption of brand-name and generic drugs into a person's body. The average difference in absorption between the generic and the brand-name drug was 3.5 percent, comparable to the difference between two batches of a brand-name drug. Non-innovator versions of biologic drugs, or biosimilars, require clinical trials for immunogenicity in addition to tests establishing bioequivalency. These products cannot be entirely identical because of batch-to-batch variability and their biological nature, and they are subject to extra rules. When an application is approved, the FDA adds the generic drug to its Approved Drug Products with Therapeutic Equivalence Evaluations list and annotates the list to show equivalence between the reference-listed drug and the generic. The FDA also recognizes drugs that use the same ingredients with different bioavailability, and divides them into therapeutic equivalence groups. For example, as of 2006, diltiazem hydrochloride had four equivalence groups, all using the same active ingredient, but considered equivalent only within each group. In order to start selling a drug promptly after the patent on innovator drug expires, a generic company has to file its ANDA well before the patent expires. This puts the generic company at risk of being sued for patent infringement, since the act of filing the ANDA is considered "constructive infringement" of the patent. In order to incentivize generic companies to take that risk the Hatch-Waxman act granted a 180-day administrative exclusivity period to generic drug manufacturers who are the first to file an ANDA. When faced with patent litigation from the drug innovator or patent holder, generic companies will often counter-sue, challenging the validity of the patent. Like any litigation between private parties, the innovator and generic companies may choose to settle the litigation. Some of these settlement agreements have been struck down by courts when they took the form of reverse payment patent settlement agreements, in which the generic company basically accepts a payment to drop the litigation, delaying the introduction of the generic product and frustrating the purpose of the Hatch–Waxman Act. Innovator companies sometimes try to maintain some of the revenue from their drug after patents expire by allowing another company to sell an authorized generic; a 2011 FTC report found that consumers benefitted from lower costs when an authorized generic was introduced during the 180 day exclusivity period, as it created competition. Innovator companies may also present arguments to the FDA that the ANDA should not be accepted by filing an FDA citizen petition. Citizen petitions are part of the basic law governing everything the FDA does—at any time, any "interested person" can request that the FDA "issue, amend, or revoke a regulation or order", or "take or refrain from taking any other form of administrative action." A series of scandals around the approval of generic drugs in the late 1980s shook public confidence in generic drugs; there were several instances in which companies obtained bioequivalence data fraudulently, by using the branded drug in their tests instead of their own product, and a congressional investigation found corruption at the FDA, where employees were accepting bribes to approve some generic companies' applications and delaying or denying others. Some generic drugs are viewed with suspicion by doctors. For example, warfarin (Coumadin) has a narrow therapeutic window and requires frequent blood tests to make sure patients do not have a subtherapeutic or a toxic level. A study performed in Ontario showed that replacing Coumadin with generic warfarin was safe, but many physicians are not comfortable with their patients taking branded generic equivalents. In some countries (for example, Australia) where a drug is prescribed under more than one brand name, doctors may choose not to allow pharmacists to substitute a brand different from the one prescribed unless the consumer requests it. In 2007, North Carolina Public Radio's The People's Pharmacy began reporting on consumers' complaints that generic versions of bupropion (Wellbutrin) were yielding unexpected effects. Subsequently, Impax Laboratories's 300 mg extended-release tablets, marketed by Teva Pharmaceutical Industries, were withdrawn from the US market after the FDA determined in 2012 that they were not bioequivalent. Two women, each claiming to have suffered severe medical complications from a generic version of metoclopramide, lost their Supreme Court appeal on June 23, 2011. In a 5–4 ruling in PLIVA, Inc. v. Mensing, the court held that generic companies cannot be held liable for information, or the lack of information, on the originator's label. The Indian government began encouraging more drug manufacturing by Indian companies in the early 1960s, and with the Patents Act in 1970. The Patents Act removed composition patents for foods and drugs, and though it kept process patents, these were shortened to a period of five to seven years. The resulting lack of patent protection created a niche in both the Indian and global markets that Indian companies filled by reverse-engineering new processes for manufacturing low-cost drugs. The code of ethics issued by the Medical Council of India in 2002 calls for physicians to prescribe drugs by their generic names only. India is a leading country in the world's generic drugs market, with Sun Pharmaceuticals being the largest pharmaceutical company in India. Indian generics companies exported US$17.3 billion worth of drugs in the 2017–18 (April–March) year. Generic drug production is a large part of the pharmaceutical industry in China. Western observers have said that China lacks administrative protection for patents. However, entry to the World Trade Organization has brought a stronger patent system. ^ a b "What's the difference between brand-name and generic prescription drugs?". Scientific American. Retrieved 2017-11-11. ^ "Food & Drug Administration, Generic Drugs: Questions and Answers". Food and Drug Administration. January 12, 2010. Retrieved 2010-02-03. ^ U.S. Food and Drug Administration. "Biosimilar and Interchangeable Products". www.fda.gov. Retrieved 5 May 2018. ^ a b c "An insider's view of generic-drug pricing". Los Angeles Times. March 25, 2013. ^ a b "Generic Drug Savings in the U.S" (PDF). Washington, DC: Generic Pharmaceutical Association (GPhA). 2015. Retrieved 16 June 2016. ^ "FAQ on generic drugs". FDA. Food and drug administration. Retrieved 21 May 2018. ^ "FDA White Paper: Generic Drug Prices in the US Are Lower Than Drug Prices in Canada". FDA. 6.US Food and Drug Administration, Office of Planning. Retrieved 21 May 2018. ^ "Branded Generics: Misunderstood, but Lucrative". Pharmacy Times. 1 October 2008. Retrieved 21 May 2018. ^ "Big Pharma Embraces Branded Generics". Seeking Alpha. Seeking alpha. 2010-10-31. Retrieved 21 May 2018. ^ a b Gupta, H; Kumar, S; Roy, SK; Gaud, RS (January 2010). "Patent protection strategies". Journal of Pharmacy & Bioallied Sciences. 2 (1): 2–7. doi:10.4103/0975-7406.62694. PMC 3146086. PMID 21814422. ^ Frakt, Austin (28 September 2015). "How Patent Law Can Block Even Lifesaving Drugs". The New York Times. ^ DiMasi J.A. ; et al. (2003). "The price of innovation: new estimates of drug development cost" (PDF). Journal of Health Economics. 22 (2): 151–185. doi:10.1016/s0167-6296(02)00126-1. hdl:10161/6706. PMID 12606142. ^ Tufts Center for the Study of Drug Development (November 18, 2014). "Cost to Develop and Win Marketing Approval for a New Drug Is $2.6 Billion". Tufts University. Archived from the original on 2014-11-21. Retrieved 2015-12-01. ^ "Authorized Generics". Generic Pharmaceutical Association (GPhA). 2008. Archived from the original on 2008-05-29. Retrieved 2008-06-16. ^ a b c "Savings From Generic Drugs Purchased at Retail Pharmacies". Food and Drug Administration. April 2004. Archived from the original on 2008-02-23. Retrieved 2008-07-11. ^ "The role of reverse engineering in the development of generic formulations". www.clihouston.com. Retrieved 23 May 2017. ^ Benson, Mike (February 20, 2015). "What it takes to be called 'big pharma' - Market Realist". Market Realist. ^ "Thailand to import generic version of heart drug Plavix from India". Forbes. 2007-08-22. Retrieved 2008-10-13. ^ "With US trade under a cloud, China opens to Indian pharma". Times of India. ^ "Price decay after loss of brand exclusivity (patent expiry) and generic launch". PharmaPhorum. 4 Apr 2012. Archived from the original on 31 January 2013. 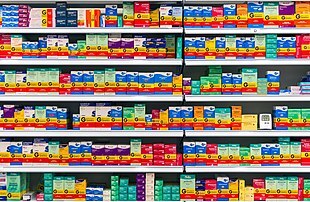 ^ "No-deal Brexit 'will force up price of generic drugs'". Health Service Journal. 26 September 2018. Retrieved 4 November 2018. ^ Altstedter, Ari (18 May 2017). "Glenmark's Glenn Saldanha seeks a new holy grail as generic drugs run dry". Live Mint. ^ Page, A; Etherton-Beer, C (January 2018). "Choosing a medication brand: Excipients, food intolerance and prescribing in older people". Maturitas. 107: 103–109. doi:10.1016/j.maturitas.2017.11.001. PMID 29169573. ^ Davit, BM; Nwakama PE; Buehler GJ; Conner Dp; Haidar SH; Patel DT; Yang Y; Yu LX; Woodcock J (2009). "Comparing generic and innovator drugs: a review of 12 years of bioequivalence data from the United States Food and Drug Administration". Annals of Pharmacology (Submitted manuscript). 43 (10): 1583–97. doi:10.1345/aph.1m141. PMID 19776300. ^ Warren, JB (2013). "Generics, chemisimilars and biosimilars: is clinical testing fit for purpose?". Br J Clin Pharmacol. 75 (1): 7–14. doi:10.1111/j.1365-2125.2012.04323.x. PMC 3555041. PMID 22574725. ^ "Generic Initiative for Value and Efficiency (GIVE)". FDA. October 4, 2007. Retrieved 2008-06-15. ^ a b c Mossinghoff GJ (1999). "Overview of the Hatch-Waxman Act and its impact on the drug development process" (PDF). Food Drug Law J. 54 (2): 187–94. PMID 11758572. ^ "Orange Book Annual Preface, Statistical Criteria for Bioequivalence". Approved Drug Products with Therapeutic Equivalence Evaluations 29th Edition. U.S. Food and Drug Administration Center for Drug Evaluation and Research. 2009-06-18. Retrieved 2009-08-10. ^ "Facts about Generic Drugs". Food and Drug Administration. ^ Davit; et al. (2009). "Comparing generic and innovator drugs: a review of 12 years of bioequivalence data from the United States Food and Drug Administration". Ann Pharmacother (Submitted manuscript). 43 (10): 1583–97. doi:10.1345/aph.1m141. PMID 19776300. ^ Calo-Fernández, Bruno; Martínez-Hurtado J L (2012-12-12). "Biosimilars: Company Strategies to Capture Value from the Biologics Market". Pharmaceuticals. 5 (12): 1393–1408. doi:10.3390/ph5121393. PMC 3816668. PMID 24281342. Retrieved 2012-12-12. ^ "Guidance for Industry: 180-Day Generic Drug Exclusivity Under the Hatch-Waxman Amendments to the Federal Food, Drug, and Cosmetic Act" (PDF). FDA, Center for Drug Evaluation and Research (CDER). June 1998. Retrieved August 24, 2009. ^ "Paragraph IV Drug Product Applications: Generic Drug Patent Challenge Notifications". FDA, Office of Generic Drugs (OGD). 2008-06-11. Retrieved 2008-06-16. ^ Wyatt, Edward (17 June 2013). "Supreme Court Lets Regulators Sue Over Generic Drug Deals". New York Times. Retrieved 9 May 2015. ^ "#223: Authorized Generic Drug Study". FTC. August 2011. ^ "Authorized Generic Drugs: Short-Term Effects and Long-Term ImpactAuthorized Generic Drugs: Short-Term Effects and Long-Term Impact" (PDF). FTC. August 2011. ^ Carrier, Michael A.; Wander, Daryl (2012). "Citizen Petitions: An Empirical Study" (PDF). Cardozo Law Review. 34: 249–293. Archived from the original (PDF) on 2016-08-03. Retrieved 2016-09-14. ^ Strickland, Carol (15 October 1989). "Bolar: A Drug Company Under Siege". The New York Times. ^ Freudenheim, Milt (10 September 1989). "Exposing the F.D.A." New York Times. ^ Andrews, Edmund L. (31 July 1989). "F.D.A. Inquiry on Generic Drugs Focuses on Changes in Ingredients". The New York Times. ^ Pereira JA, Holbrook AM, Dolovich L, Goldsmith C, Thabane L, Douketis JD, Crowther MA, Bates SM, Ginsberg JS (2005). "Are brand-name and generic warfarin interchangeable? Multiple n-of-1 randomized, crossover trials". Ann Pharmacother. 39 (7–8): 1188–93. doi:10.1345/aph.1G003. PMID 15914517. Archived from the original on 2011-06-16. ^ Pereira JA, Holbrook AM, Dolovich L, Goldsmith C, Thabane L, Douketis JD, Crowther M, Bates SM, Ginsberg JS (2005). "Are brand-name and generic warfarin interchangeable? A survey of Ontario patients and physicians" (PDF). Can J Clin Pharmacol. 12 (3): e229–39. PMID 16278495. Archived from the original (PDF) on 2007-11-29. ^ "Generic medicines training kit: safe and appropriate use of generic medicines". Pharmaceutical Society of Australia Competency Standards for Pharmacists in Australia 2003. National Prescribing Service Limited (NPS). 2003-07-09. Archived from the original on 2009-10-20. Retrieved 2010-01-24. "Prescribers may disallow brand switching by ticking the relevant box on the PBS prescription form"
^ "Drug Tests: Wellbutrin vs. Generic Bupropion". 2012-12-06. Retrieved 2013-04-20. ^ Healy, Melissa (2012-10-05). "Generic antidepressant pulled from U.S. shelves after FDA finding". Los Angeles Times. Retrieved 2013-04-20. ^ "FDA Update: Budeprion XL 300 mg Not Therapeutically Equivalent to Wellbutrin XL 300 mg". U.S. Food and Drug Administration. 2012-10-03. Retrieved 2013-04-20. ^ "PLIVA, Inc. v. Mensing - SCOTUSblog". SCOTUS Blog. Retrieved 23 May 2017. ^ Mears, B (2011-06-23). "High Court sides with generic drug makers in narrow ruling". CNN. Retrieved 2013-01-01. ^ George T. Haley; Usha C.V. Haley (2012). "The effects of patent-law changes on innovation: The case of India's pharmaceutical industry". Technological Forecasting and Social Change. 79 (4): 607–619. doi:10.1016/j.techfore.2011.05.012. ^ Bhosle, Deepak; Sayyed, Asif; Bhagat, Abhijeet; Shaikh, Huzaif; Sheikh, Alimuddin; Bhopale, Vasundhara; Quazi, Zubair (20 December 2016). "Comparison of Generic and Branded Drugs on Cost Effective and Cost Benefit Analysis" (PDF). Annals of International Medical and Dental Research. 3 (1). doi:10.21276/aimdr.2017.3.1.PC1.